This software engineer job description is a good way for employers to ensure that employees get all the proper training and experience for developing and programming computer software. Software testing and quality assurance. Designing applications in various software languages. Conducting system analysis and development. Research and recommend new software tools. Maintain and update accurate files. 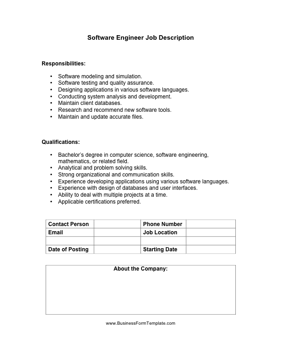 Bachelor's degree in computer science, software engineering, mathematics, or related field. Experience developing applications using various software languages. Experience with design of databases and user interfaces. Ability to deal with multiple projects at a time.